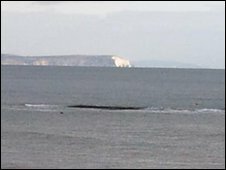 The performance of Boscombe's £3m artificial surf reef since it opened has been sub-standard, Bournemouth Borough Council has confirmed. The findings came from experts at Plymouth University who assessed the quality of waves enhanced by the underwater creation over six months. The team found the surf reef only achieved four of its 11 objectives. The council said it would withhold a £150,000 payment from its creator, ASR Ltd, until it is satisfied it works. The New Zealand-based firm denied the reef failed and said it was only one of the criteria - the wave lengths - which it had not met. Plymouth University, home of the UK's first marine institute, has been assessing the quality of the reef's waves and the number of days suitable for surfing since last September. The information, part of a 12-month independent report, was collected from on-site cameras and location visits which monitored the shape and power of the breaking waves. Dr Mark Davidson, from the Plymouth University team, told BBC News: "[The reef] does fall short in a number of ways - in particular the ride length is a little too short. "The wave length is rather too intense and challenging [and it] is not quite as consistent as it should be." The construction opened in November after a delay of more than a year and at nearly double the proposed cost. There has been a mixed response to the reef's success from surfers. It was created to improve surfing conditions using 55 sand-filled "geotextile bags" which are 225m (740ft) out to sea. 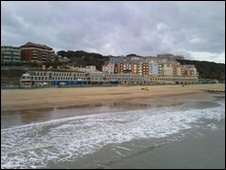 Bournemouth Borough Council went ahead with the plan as part of an £11m overall regeneration of Boscombe, in an attempt to improve its rundown image and attract a new crowd of visitors. The seafront promenade has been redeveloped with new restaurants and apartments, and a surf festival was held there in March. Roger Brown, head of leisure services at the council, told BBC News: "In the latest discussions with [ASR] they are committed to undertaking some field work on site in order to help refine some outline design proposals for the reef." The findings will be discussed publicly at a council cabinet meeting on 26 May. ASR, which designed similar reefs in Mount Maunganui on the north island in New Zealand, and Narrowneck, Australia, said it had data which confirmed the only the criteria the reef had not met was the wave lengths. A spokeswoman said ASR and the council were discussing ways of "making enhancements to the reef".